I wish you could have been there when I gave Brittany the sweater. I wasn’t sure she would appreciate the work you put into it — not just in the intricate design but how you worked to make it according to those “particular specifications” she asked for – long and skinny. But she did; she ooed and ahed at the color changes and cooed when she put it on. But mom, that isn’t what I wished you had been there to witness. No, what I wish you had seen was how she purred when she saw the label you stitched at the collar that said Hand made for you by Frances McGown. The sweater is as beautiful as your letter to your mom. How she will treasure those words. I can’t imagine creating something so intricate, & being able to adapt the specifications-WOW! Wow, what a special way to mark the gift! The tag is really a neat idea! Thanks for sharing this powerful description of your word! Sooo, sooooo special. My grandmother, my dad’s mom, was a knitter. I still have the afghan she knit for me when I was ten- forty years later! “Purred” – I love that word for her response to the magnificent label. And that sweater really is gorgeous! Thanks for sharing your post. You captured the meaning behind the event! Brittany is a special young lady for noting and appreciating what really matters. My mother was a milliner – a hat maker – and I never see hats in sales or consignment shops that I don’t pick them up and look for her label. 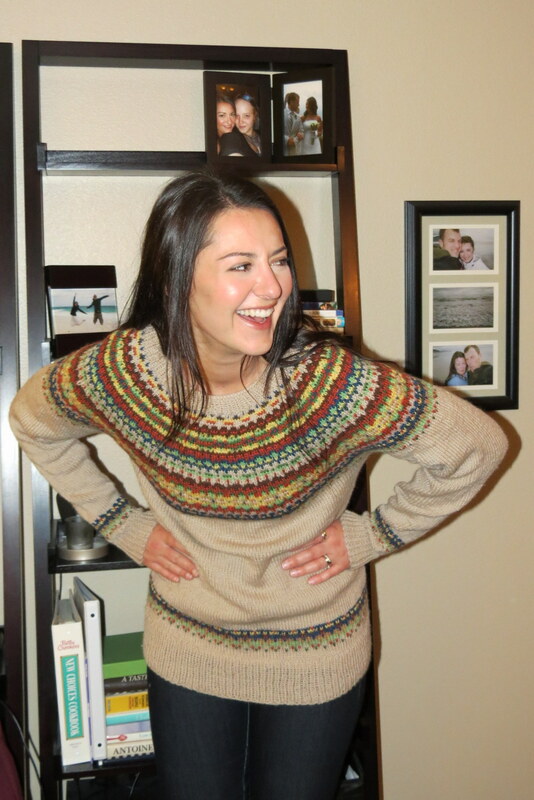 Also – the sweater is a perfect fit – in size and design!